It’s hard being a competitive person in London. Opportunities to compete as a team against others are limited at best, and it’s tough to find a good group event that allows for the talents of many to play a role in an overall victory. Thank goodness then, for HintHunt – a “simple* and fun live escape game” near Euston station in which mysterious clues and a series of puzzles must be solved by a team of 3-5 people in order to solve a murder mystery and eventually escape the room in which you are locked into. The puzzles cover a variety of skill sets – there are brain teasers, mathematical challenges, and codes to break whilst investigating said murder – and did I mention you have exactly 60 minutes in which to save the day, solve the murder, and break out of the room? It is tremendous fun. We visited in a group of ten, and divided into two groups of five – each of us had an identical room to search concurrently to each other (and then results to compare at the end.) You are alone with your group in the room, and your communication to the outside world is limited to a TV screen in which the game admins can offer you clues as and when they are needed. The admins watch and listen from CCTV (not as weird as it sounds) and it takes about 5 seconds of being in the room to forget you are being watched. The clues offered are extremely valuable; I can’t imagine a group being able to do this without them, to be honest. It should be noted that this isn’t easy and that fun as it is, not everyone “wins” and solves the murder – but not solving it doesn’t put a damper on the enjoyment. Each clue solved is a victory, and it’s important to note that the fastest anyone has ever gotten out of the room is 53 minutes. That’s 7 minutes before time’s up, mind. Of our two groups, one finished in 58:56 and the other sadly never made it out– but all ten of us stumbled out into the glaringly bright daylight completed pumped by the incredible brain teasers we just experienced, and all of us cannot wait to do it again in one of their other rooms. You can book tickets and learn more about HintHunt here. We felt it was good having the full 5 people in each team – we covered a LOT of ground that way. If you feel claustrophobic – just let them know when you get there! The people running the game are lovely and accommodating and they will leave the door open for you if you need it. The most important skill you can bring to the table is the ability to think outside of the box – and the ability to add. If you can’t figure something out MOVE ON and come back to it later when you have more information to solve it. 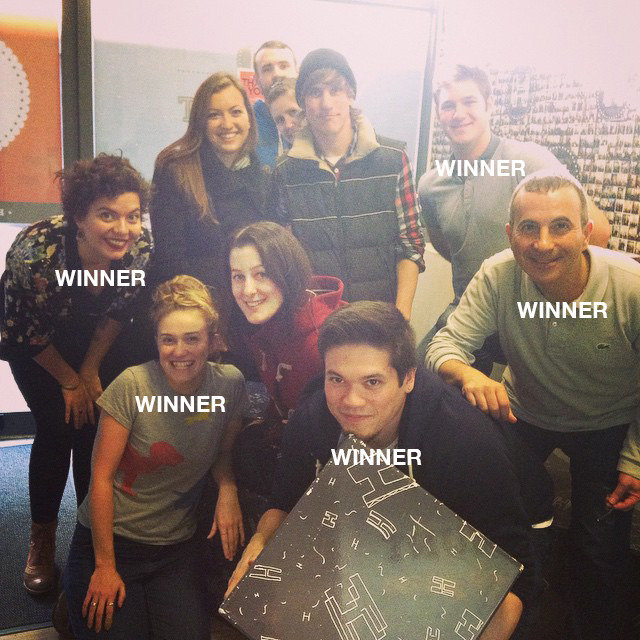 Here’s us after our adventure – since we put both teams together for our photo, I’ve helpfully added in the word ‘WINNER’ to help identify the winning team members. This entry was posted in Immersive Theatre, Theatre and tagged Escape Game, Hint Hunt, HIntHunt, Review. Bookmark the permalink.